Sean Dowling at HCT in Sharjah repeats his webinar entitled “Making the most of e-books for academic skills” on Nov 19 (7pm in UAE). Click here for details. 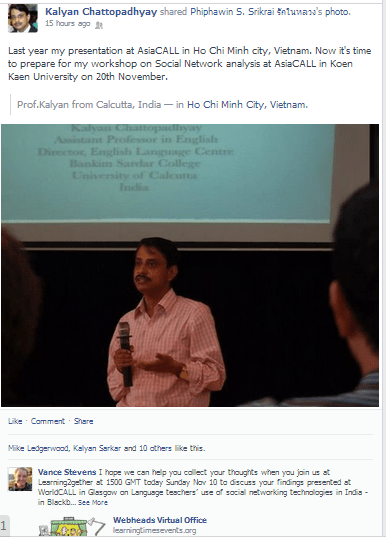 Dear Colleagues,The U.S. Department of State and UC Berkeley are offering a 5-week writing course College Writing 2.1x: Principles of Written English. This course is an open online course available to both English language learners and teachers interested in academic writing.This course is free and open to any interested participants. The course begins Friday, November 8th and will be 5-weeks long. All coursework is asynchronous (meaning the content can be accessed at anytime during the week and there are no live sessions to attend) and assignments are due at the end of each week. Learn more and register here: https://www.edx.org/course/berkeley/colwri2-1x/college-writing-2-1x-principles/1194. You can also visit the course Facebook Page.Check with your local U.S. Embassies and American Corners as some are hosting supplemental facilitation sessions to collaborate with students and colleagues during this learning process. Or consider forming your own learning group! We showed in this session how, although only ten are able to get into a Hangout at any one time, we can manage it with dozens of moderators by setting up an etherpad clone at http://webheadsinaction.org/live, streaming the session there live, and using the text chat to manage a revolving door so that people can have some minutes in the Hangout, withdraw, and others may enter. And everyone can participate. Last week L2g and EVO moderators met at Bb Collaborate Elluminate which is a good choice for online events for simplicity. 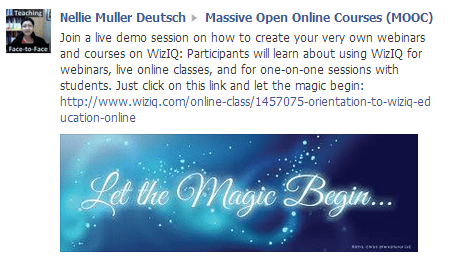 It works well, anyone can get in without credentials, and will give you a recording of your session. You can download Elluminate Publish and get an mp3 or mp4 of your sessions if you wish. We talked last week about how you can be a moderator of your session and if anyone wants to know more about that just write this list. 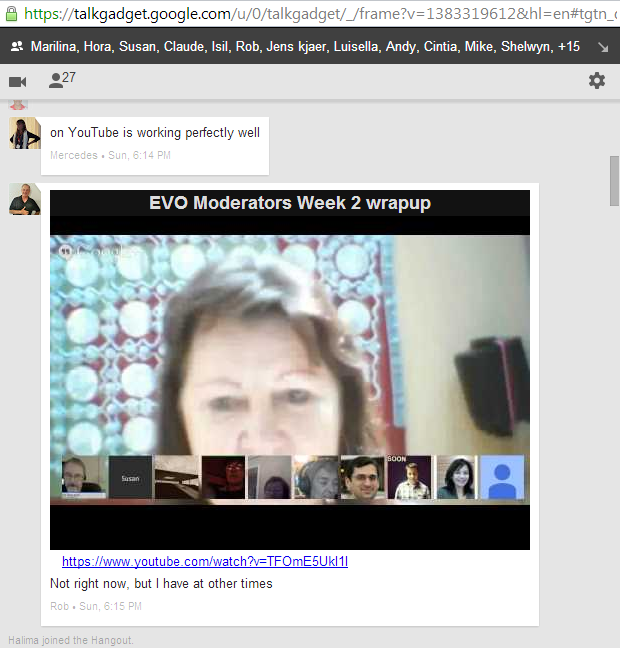 This week we are going to learn how to run a Google+ Hangout on Air in such a way that you overcome the just-ten limitation of people actually in the HoA and stream to a wider audience, and interact with them in text chat so that you can revolve more participants in and out of your hangout. You can set this up in any blog or wiki where you can embed a YouTube video, and in the same way you embed an Etherpad clone text chat. 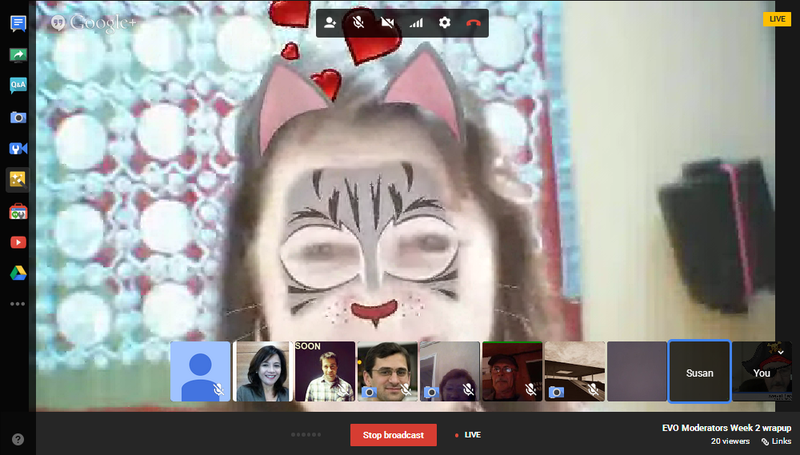 You then set up a Hangout and get its embed code. You can get this before you actually start recording the hangout (in other words, the embed works, but visitors are told to come back later until you start the HoA). 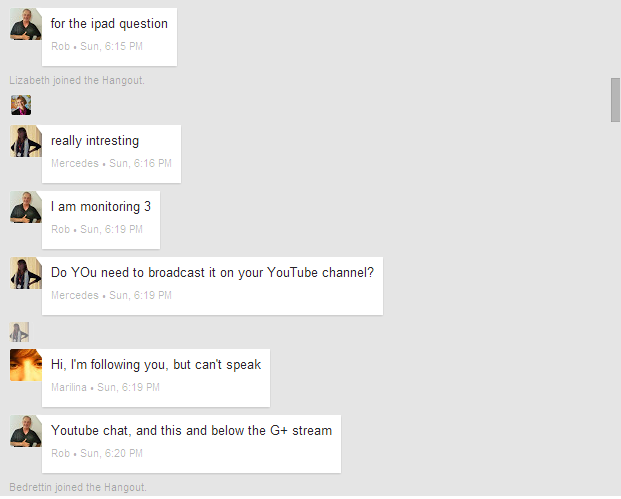 When you activate the HoA, the embedded video will stream the Hangout live via its embed code. 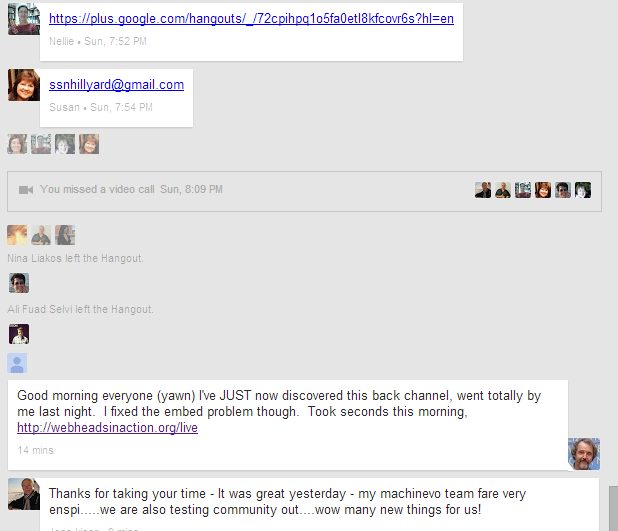 When the hangout ends, that same code becomes the archive recording of the event, on YouTube. The technique is to plant this embed at your blog or wiki site. 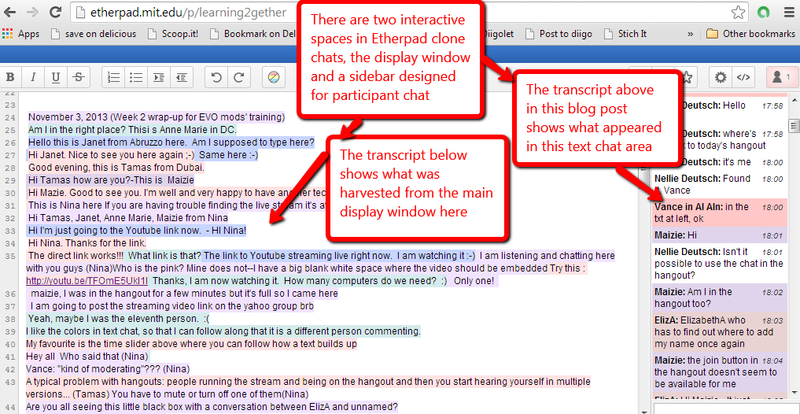 You can also embed a text chat (we use Etherpad clones) so that on the same page people can listen to the streamed hangout through the YouTube embed and interact with you and each other in the Etherpad clone embedded there as well. I learned this technique from my mentor Jeff Lebow, to whom many gratitudes, and in deference to the master, who took the trouble to take out a domain name on http:webheadsinaction.org/ I continue to use http://webheadsinaction.org/live to stream our hangouts. To find out what to do on Sunday, you can go to the above link, where you will find the streaming video and the text pad where you can interact with us in txt chat. You can also find here and at http://learning2gether.pbworks.com/w/page/32206114/volunteersneeded#Nextupcomingevents the direct URL for the HoA, which we will have once we start the Hangout (to get its embed code, but not start streaming until 1400 GMT). So, you can start at http://webheadsinaction.org/live. If you are an early bird you will find the HoA URL there and can join us in the HoA. When the HoA has ten people you won’t be able to join directly but you can listen in the stream and interact with us in the text pad. We will need people to monitor that by the way and alert me if I miss anything there due to multitasking. If you are one of ten people in the HoA and if you feel you have said what you want to say, you can excuse yourself and we can announce on air and in the txt pad that there are more places in the HoA. Normally we have people coming and going as with a revolving door. At the end you all see yourselves on YouTube, what could be more wonderful? So, come along and see how it works, and it will be F.U.N. if nothing else. 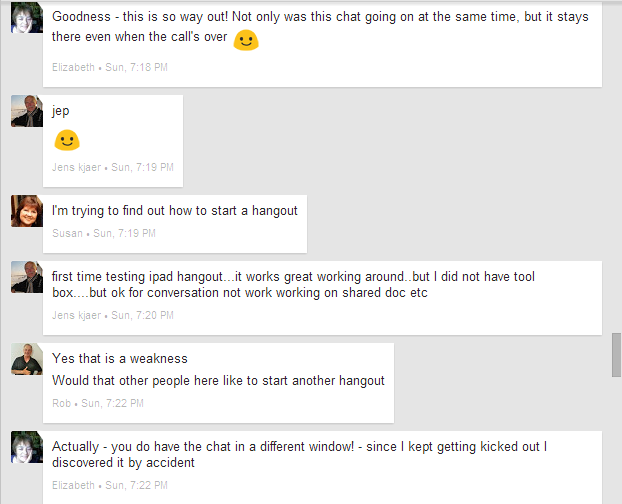 Nellie Deutsch:18:01 Isn’t it possible to use the chat in the hangout? 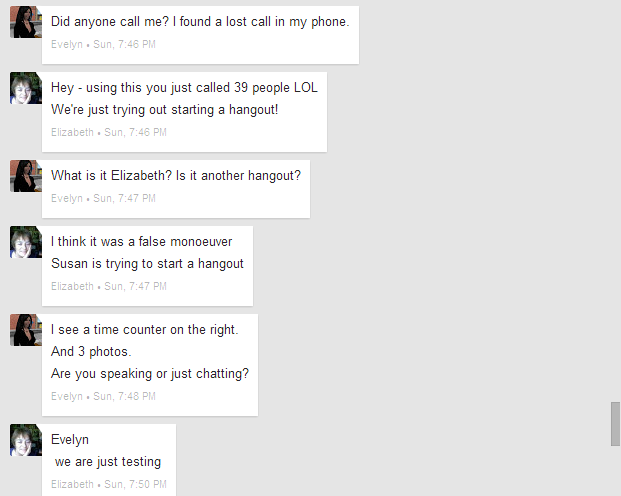 Maizie:18:02 Am I in the hangout too? ElizA:18:06 Yikes – I’m off to change my colour ! 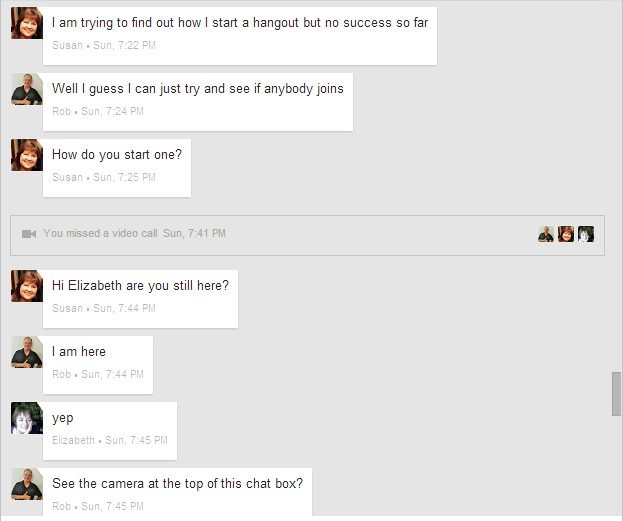 Maizie:18:06 I have been here for ages waiting to join the hangout there was only Vance & me how comes its full? ElizA:18:10 I was in for 2 seconds – the connection dropped and now it says it full on my screen ! Maizie:18:11 Well it still says I’m about to join! Vance in Al AIn:18:11 does the direct link work? Maizie:18:12 where is the direct youtube link? ElizA:18:15 Tamas – were you in at any time? ElizA:18:16 could that be a part of the prob of getting in? 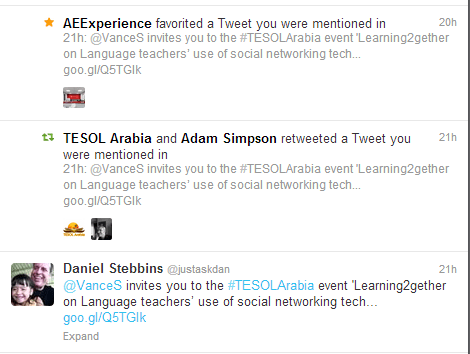 Tamas Lorincz:18:17 Interaction here seems to be pretty awesome though. Tamas Lorincz:18:17 Yes, that can be a reason. ElizA:18:17 (@TL – I just don’t see you “barging” anywhere ! ElizA:18:18 Jens – are you in or out? Tamas Lorincz:18:18 Yes, I am and it’s looking pretty good. Jens Kjaer Olsen. Denmark:18:18 am i on here? ElizA:18:20 Cool – I’ve got the you tube streaming on my tablet! Janet:18:26 I’ve just posted this once, but it’s on teresa’s name? ElizA:18:27 I’ve lost the stream – anyone else lost it? Tamas Lorincz:18:28 I’m still in. Do you need the link again? ElizA:18:32 Is that the right whale? Tamas Lorincz:18:33 Click on the icon in the upper right hand corner of etherpad and insert your name in the top box, and hit enter. ElizA:18:33 add your name there! 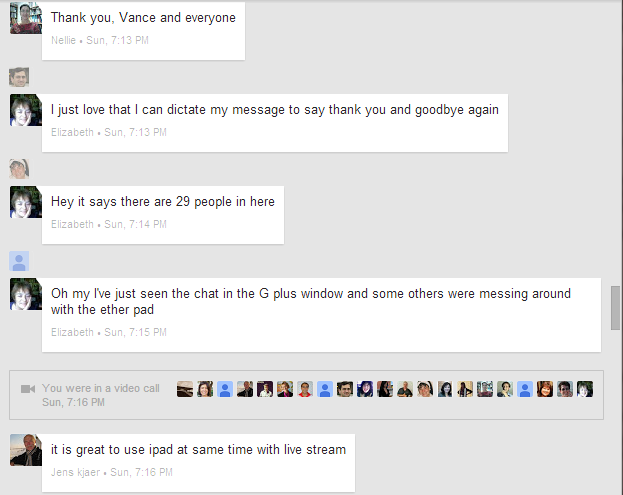 Vance in Al AIn:18:36 I’m not following the chat here very well, but I’m looking at it now. Any issues? Tamas Lorincz:18:40 You see, I get Sarah Palin…. unnamed:18:45 teresa just said that. i’m unnamed again. Janet:18:46 (Janet) to Teresa – how can we swap names? Tamas Lorincz:18:54 Bye wonderful Marisa. Vance in Al AIn:18:56 yay Janet~!!! Janet:19:00 Sorry I have to leave now. It’s been very informative. Thanks so much everyone! Tamas Lorincz:19:09 I’m signing out too. This has been fun. Jens Kjaer Olsen. Denmark:19:18 bye everybody…! 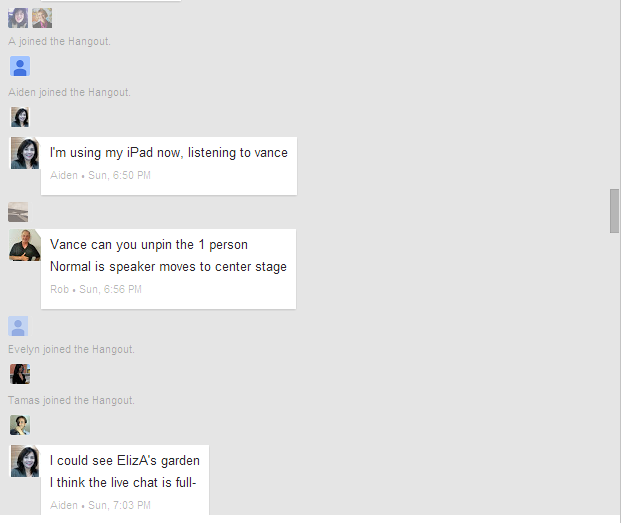 Vance Stevens in in this chat space now. You can use this chat space at any time but especially from around noon to 1400 GMT on any Sunday where we have a Hangout planned, to connect with the Webheads in Action and Learning2gether communities. Am I in the right place? Thisi s Anne Marie in DC. Hello this is Janet from Abruzzo here. Am I supposed to type here? Good evening, this is Tamas from Dubai. Hi I’m just going to the Youtube link now. – HI Nina! Hi Nina. Thanks for the link. The direct link works!!! What link is that? The link to Youtube streaming live right now. I am watching it 🙂 I am listening and chatting here with you guys (Nina)Who is the pink? Mine does not–I have a big blank white space where the video should be embedded Try this : http://youtu.be/TFOmE5UkI1I Thanks, I am now watching it. How many computers do we need? 🙂 Only one! 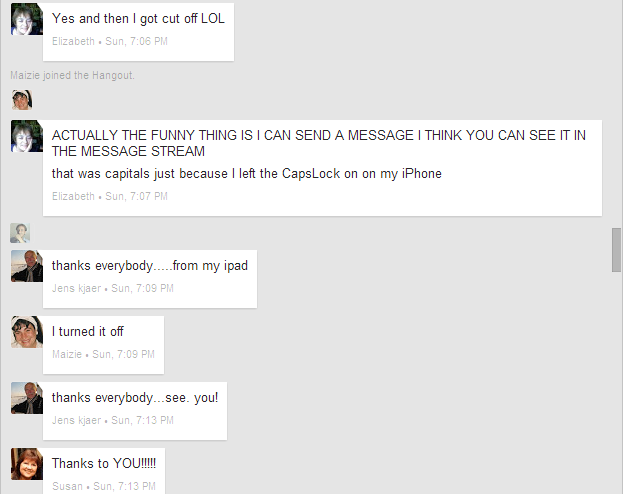 I like the colors in text chat, so that I can follow along that it is a different person commenting. Are you all seeing this little black box with a conversation between ElizA and unnamed? Yes, Where is that coming from? 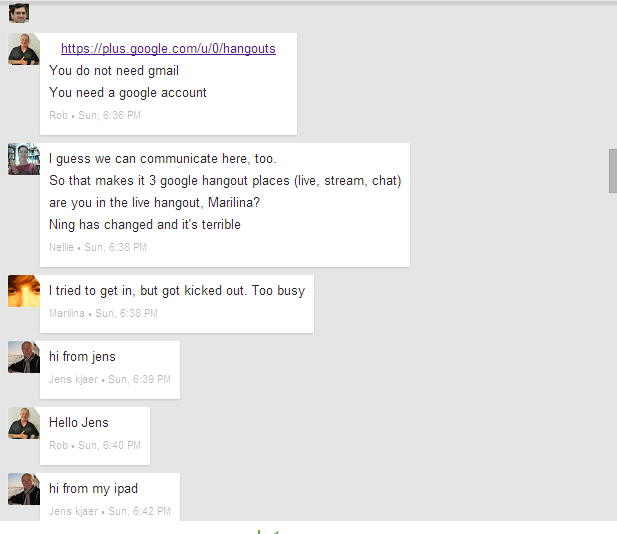 I have actually used hangouts quite a lot and am quite OK – but limitation of 10 people when you have a large group somewhat limiting Yes, exactly, and this etherpad and youtube stream are a bit …confusing? It’s not obvious how to move from here to there (right now there are 10 people there so there is no room) But is tehre someone over there monitoring this chat? Maybe there could be a line of people who want to try the hangout? But somebody over there needs to be telling people to leave so the next in line can joib. it’s really more complicated than I would like to deal with, if I were moderating a chat. It does break up conversations in a funny way and lightens the mood. 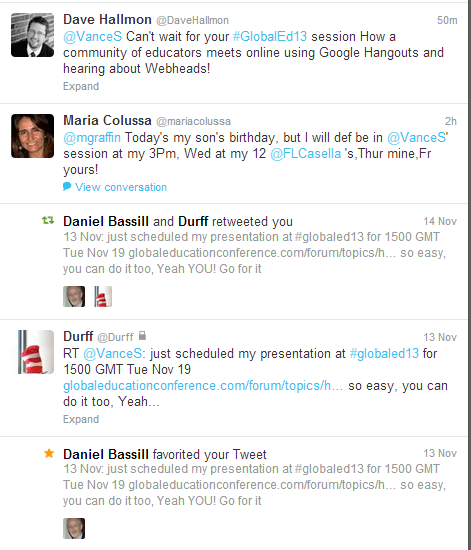 RE: What Vance just said about Elluminate (now Blackboard Collaborate) –it works much better for large groups. WiZIQ too. I have just spent some time on WiziQ and it looks really useful. Maizie Click this link and then accept that you are going on air and it should work. We have a lot of work to do tonight, so please let me say thank you!! I will listen to the last of the youtube session. Continuing the conversation at https://plus.google.com/hangouts/_/72cpjnj56qgsqg8kbq1mi753ec?authuser=0&hl=en with Nina and Nellie! A list of the currently scheduled guest for the rest of the month is below, but it’s changing every hour so don’t come here to see it updated–go to http://bit.ly/connected_cafe to stay updated, or look for our events in the Connected Educators calendar. Vance Stevens raves about this product. You download it (free) to your computer and it works quite well to download a version of the YouTube video of your choice to your computer (in the video format you specify) and from that makes an mp3 from the copy on your computer. Once you set it up it’s a 1-click process to go from your cached video to mp3. Please also remember to follow us on Twitter and FaceBook!